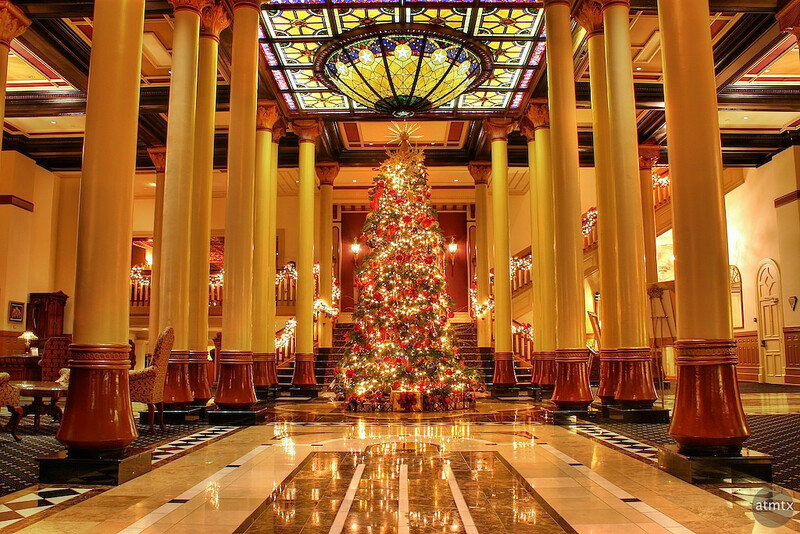 As I took at looked at my 2010 Driskill Hotel Christmas Tree photograph, I noticed how different it looked from last year’s image. They were both taken at the same hotel and from roughly the same area but they have a different feel for several different reasons. First, the tree itself is shaped very differently, this year’s is a lot wider then last year’s slender tree. The ornaments and decorations are also very different. I didn’t realize that the Driskill Christmas trees are so different from year to year, which is great because it encourages me to take photograph of the tree again next year. Photographically, the two were taken with different framing and a different white balance. What may not be obvious is that last year’s image was a HDR while this year was a straight forward, single RAW image. In addition, I believe I used my Canon 20D last year while I’ve used my latest camera, the Sony NEX-5 for this year’s image. Beyond the equipment, processing and the differences in the tree, there are other more esoteric differences. These images which are separated by about a year represents another year of my photographic exploration. I’ve been changing and hopefully growing in my photography — some of the differences you see in these photos may reflect these photographic changes. I know that more recently, my exposures tend to be darker than a year ago. I also believe I am more aware of the effects of light and shadow. While the image from last year is more uniform in brightness across the entire frame, this year there is more shadows and variation in light. A year ago, I concentrated more on creating HDR images, while now, HDR has become just one of many tools to create my photographs. HDR is still important, though it no longer takes center stage. I like both images. Which one do you like better? Either way, I would like to wish my blog readers a Merry Christmas. Its been less than a half-year since I’ve started this blog, but it has been fun and educational for me. I hope you have enjoyed reading this blog and possibly even gotten some ideas for your photography. I have some more ideas for upcoming posts so I hope you will come back and visit again. Merry Christmas, Andy! I think I like the new shot better. The extreme low angle is what does it for me. I like the color of the darker tiles better and they are more prominent in the new shot since the camera is down lower. Check out my blog for my shot of the tree this year. We should make it a tradition to go each year! Thanks, Mike! The low angle is kind of fun. Its be really easy to do with my small tripod. I guess I never realized the difference in trees either. Nice shots, Andy! One question though, what white balance setting were you using? One of the biggest differences in my photography today versus last year at this time is trying to nail the white balance whenever I shoot. Although I can’t say with 100% certainty that I get the colors exactly right, I think I’ve gotten a lot closer. While your photos of the trees are well composed, and very nicely processed, the colors look too warm to me. I like Mike’s idea of shooting the tree every year; we should make it a group thing. Hope you have a peaceful and prosperous new year. Different look in trees from 2009 in comparison to 2010—–they changed designers! Do you know if they change designers every year? Van, I totally agree that the colors from last year look very warm. I think the Photomatix processing might have added an additional redness to the image. I also probably increased the color saturation somewhat. The image from this year looks closer, I believe, but I can not vouch for its color accuracy. This may sound like a cop-out, however, I’m really not too concerned with color accuracy as long as they look reasonable. I am more picky about portraits since human skin tones are really important. For landscapes and architecture I usually amp up my color saturation a bit to create a look that I want rather than trying to get exact colors. That said, there are lots of issues with color in general since each person’s screen is different in color calibration. I’m at the mercy of the person’s LCD setting to display the image which may be very different from what I see on my screen. I am more picky about trying to match my screen image reasonably to a print, which is a completely different story maybe even more of a challenge. There are of course many issues come into play. 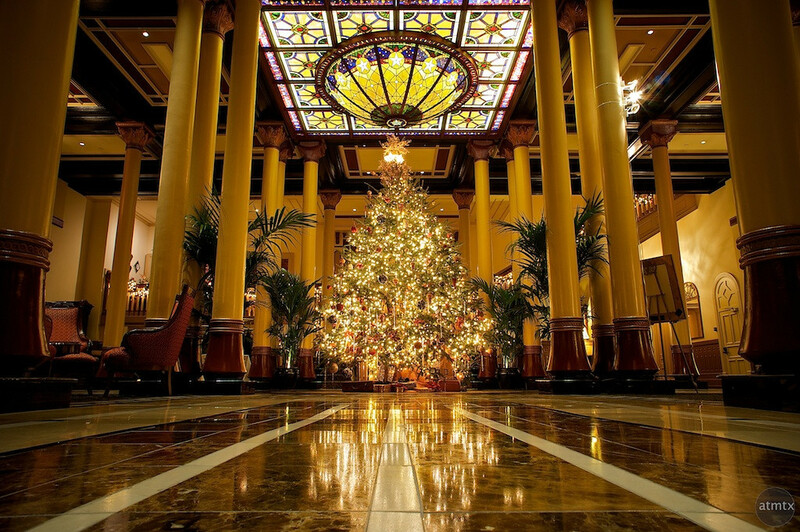 Thanks for your comment and yes, a yearly Driskill Tree viewing and photography session might be in order. I like the low camera angle used in the 2010 version as the lines on the floor lead to the tree. I prefer the use of HDR in the 2009 version. Thanks John, for your comment and visit. No, they do not change designers every year. The same company has decorated the hotel for the previous 10 years and they just changed this year to my company, Intuition Interiors. I hope I am fortunate enough to keep the account for a long time! A lot of the ornaments used this year are the same as used in the past few years…but edited quite a bit…and some new added. I love your photography. Keep posting your beautiful work! Emily, Congratulations on getting the Driskill. Hopefully you can continue with this account for many years. Thank you for your kind words. I will see what you come up with for next year’s Christmas tree.